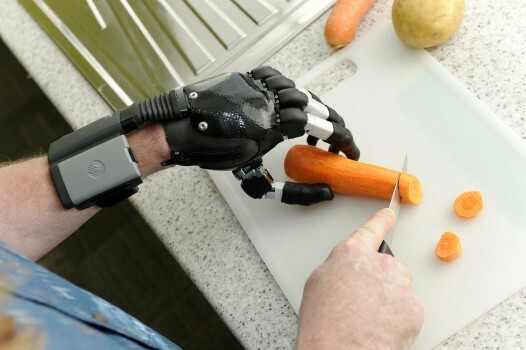 iLimb is an innovative myoelectric prosthetic hand that is used for both above and below elbow amputees. iLimb Ultra is controlled by muscular movements that are programmed to each user’s needs, taking the options for use far beyond the basic grasping capabilities offered by traditional myoelectric devices. 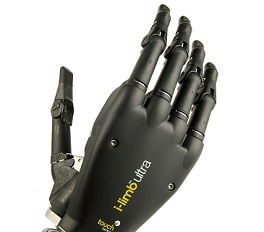 The iLimb Ultra allows independent finger movements, offering grasping options that were never before possible. Amputees who are existing myoelectric users can benefit from the ability to live much more ambidextrously with iLimb Ultra. The use of the iLimb Ultra allows arm amputees to grasp balls, cups, and more delicate objects than a traditional myoelectric hand. There is an iPhone app included with the iLimb Ultra which allows for easy control of the arm settings for specific uses of the hand, like typing. The iLimb can also be finished with a custom painted glove, which offers a very life-like high resolution silicone cosmetic option. It is important to note that advanced myoelectric devices like the iLimb Ultra require significant medical justification and a clear clinical need to be established before submitting for insurance coverage. Medical Center’s prosthetics insurance support team is highly skilled at appealing to insurance companies for coverage.